The same thing applies to the products you offer your clients. 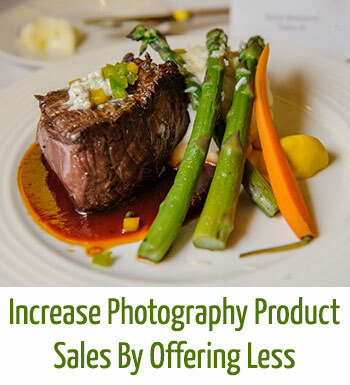 If you’ve ever had a client procrastinate on ordering or not place an order after seeing their images, you may want to consider how hard you’re making it for your clients. Let’s face it – it’s painful enough for our customers to part with their hard-earned money. The last thing we want to do is make it difficult for them to make a decision and finish the sale. I know your lab offers a few hundred different photography products, but for most of us offering something like life-sized wall clings is not worth putting on our photography product list and will only cause our list to become more cluttered. You need to simplify your product list. If it’s easy to decide, people will buy far more than if it is complicated. I promise. So what products should I sell? There’s two answers to this, and they go together. First, what do you really want to sell and why do you think it is important? Second, what does your client really want? If you absolutely hate selling greeting cards, don’t do it. Just because you CAN do it doesn’t mean you have to. Think of the products you wish every client would buy. For me, it’s albums and a wall print. It may be different for you. But these are the things you want on your list and in your packages, and you don’t want other fluff items distracting from them. My clients also want a way to share their images with friends and family, so I also offer smaller gift prints. If you hate how common 4×6 prints look, then only offer 5×7 and larger prints or collections of wallets for sharing. Tailor your product list to what you want your clients to buy that still fulfills their desires. I like to sell wall prints because I believe that if someone is investing a lot of money to have us take photos at their wedding or portraits of their family, then they should have at least one large wall print or canvas that they can see on a daily basis that makes them smile. I think albums are a fantastic way to tell the story of weddings or to keep multiple images from a portrait session all in one place. Go through your list and think about why the products on your list are important to the client. If you can’t answer this question, you’re never going to be able to sell it. But above all, keep it simple. Your clients will thank you with larger and faster sales. What is your favorite product to offer your clients? Just leave a comment below.